When I made the Kelp White Bean Dip which was a take off on my grandma’s crab dip, my dad had asked if I ever considered using hearts of palm in place of crab. He mentioned that when you eat it, the sides pull apart somewhat like string cheese giving it a look and texture much like crab. Ever since, I have been wanting to try it and decided it I would try it to make “crab” cakes. Did you know there are at least 100 different ways to make crab? I had never made them in the past so I didn’t have an old favorite to turn to. This recipe intrigued me because it didn’t use flour. I really like how them came out but they weren’t what I had in mind. 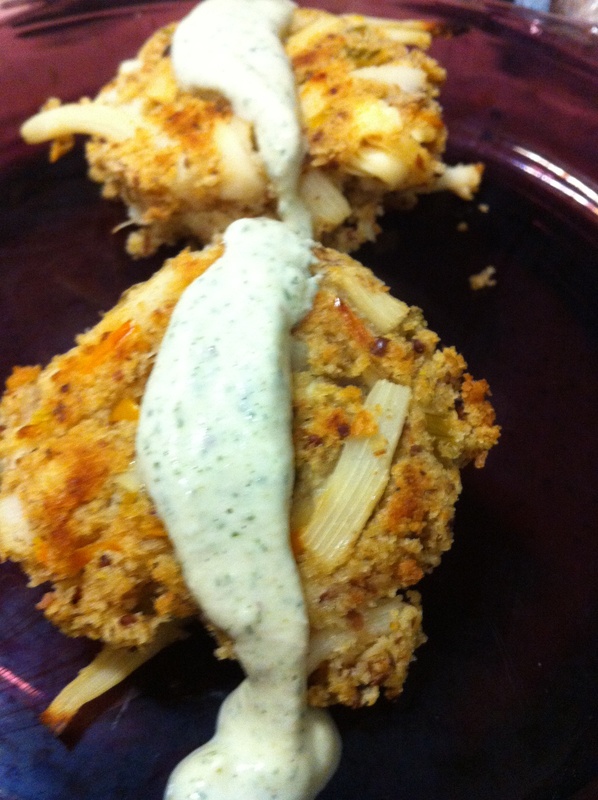 If you had a favorite crab cake recipe I would recommend trying it, using the hearts of palm, otherwise try this out. In a small cup or bowl mix flax and water with a fork, slowly adding one tablespoon of water at a time. Refrigerate at least 15 minutes. Saute onions, bell peppers, and celery in butter for ten minutes. To prepare hearts of palm, pull in strands from the top toward the bottom. Once you get to the center it is mushy and you can just add this part to the mix. I could not get mine to shred further than half way down, which was actually perfect. In a large bowl mix all ingredients together. Refrigerate for at least 30 minutes. Preheat oven to 400 degrees and lightly grease a cookie sheet. Using a tablespoon to 1/4 cup (depending on the size you want) of the chilled mixture form into cakes. Bake 15 -20 minutes (depending on size) flipping half way through cooking time. I used 1/4 cup and was able to make 8 cakes. Serve with dill dip, lemon, cocktail sauce or hot sauce. Gallery | This entry was posted in appetizer and tagged Hearts of palm. Bookmark the permalink. I love hearts of palm! This is such a creative recipe. I have bought the vegan crab cakes made at my local co-op and they were good but now I know I can make em at home , yay!!! Our little vegans favorite food is hearts of palm so I love finding new things to do with it!